Things have been going really well. This week, we took Kaylie & Mason to the park. It was the first time since surgery she had played on a playground. 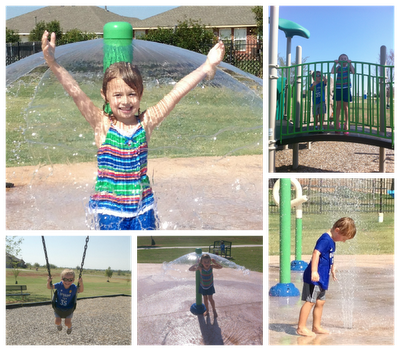 We were only there for maybe 30 minutes, and our park has a splash pad. Kaylie was cleared to swim in a pool.... BUT I have decided I'd rather her not the rest of this year. Her incision is still healing... and my personal opinion is that pool water can be nasty... I know it's chlorinated....but I just feel it would be best. Anyways... the splash pad is like sprinklers.... so we let her play for a little bit. She had a lot of fun.... but that evening she did complain that her head hurt, and the incision area was hurting. I think she over did it. The next day she was fine, and nothing was bothering her. Today she is 5 weeks post op. Her incision is still healing well. I just put up her 5 week pic.... to see the collage of pics/ the process of her healing, it is under "Kaylie's Story"... that collage will always be updated. 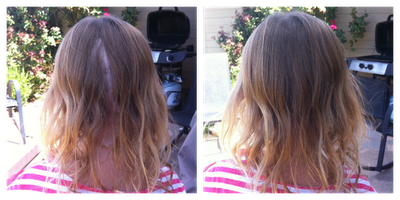 There are always questions about how much of her hair hides the incision. The pic on the left, you can kind of see it... right now because of how it is shaved... it naturally parts open like that sometimes... or when its windy out. The pic on the right is us combing it in certain areas... and you can hide it completely. 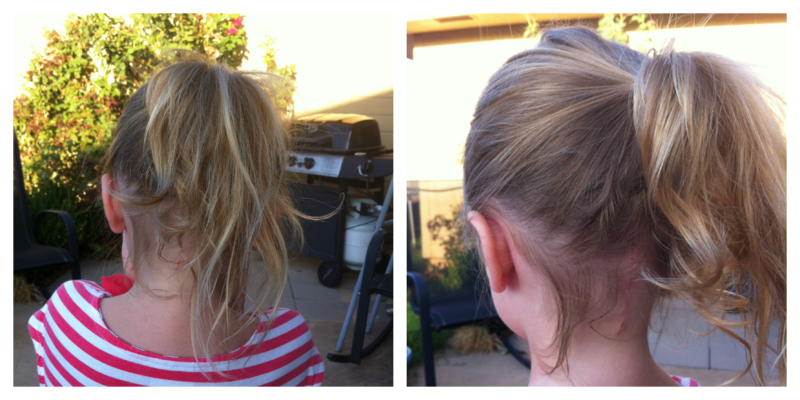 When we fix it in a ponytail... you can see some of it, but not really. You would have to be looking from the side to really see it. 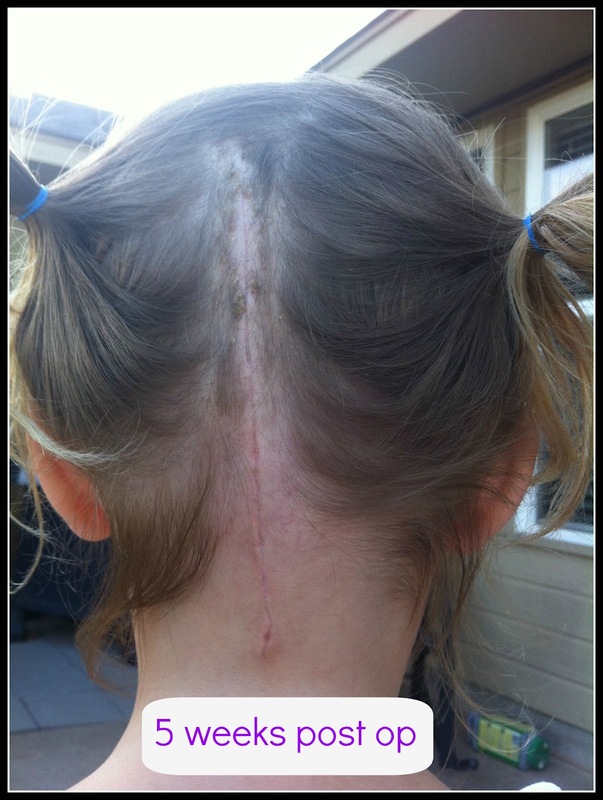 I have put these pics up... because I have seen a lot of moms go, and before surgery have their daughter's hair shaved... like the very back bottom, or cut really short. I'm not sure the reason for it all... and unless it's like a right of passage type thing they are treating it as. ~OR~ unless their NS(neurosurgeon) has asked for that.. I'm really not sure. I do know some NS do shave a lot in the back... so I think that should be a question you ask about, when talking about surgery. 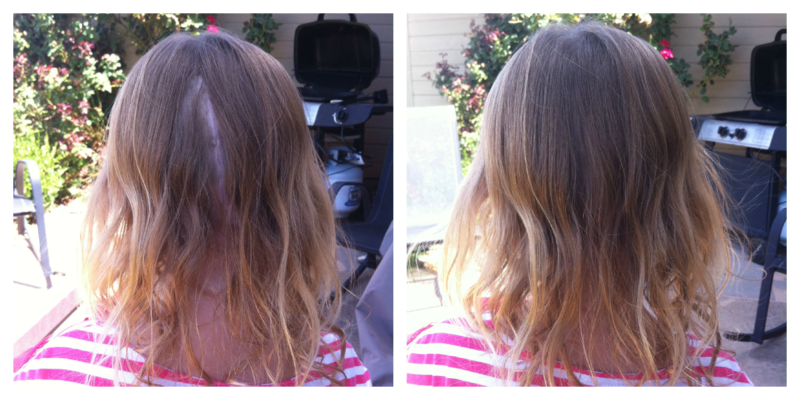 Our NS only shaved for the length of the incision (6"), in a 1 1/2" width strip. Please don't forget EVERYONE'S length and/or width of incision will be different! Kaylie has been getting her school work on Fridays, to help keep up in school. 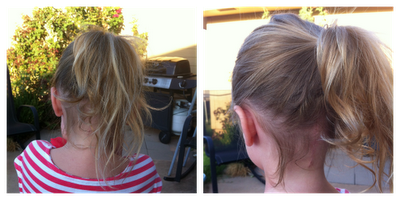 Next Thursday, we have a check up with her pediatrician, then that Fri, we will go and meet her class at school. She already knows some of them... but we have heard some have had questions about what happened to Kaylie, or why isn't she back at school... and so on. So, I thought her and I would go up, meet them, and if they had questions, to answer them. I think if you are up front with 6 year olds... they will be content with the answers, and then forget about it... because its no longer a "big" deal.. or was hidden from them. We thought this was good, since she will be returning back to school that following Monday. I do know for that first week... she will be going half days. They do most of their academics in the morning... so she won't be missing anything after lunch..like PE, and recess. Other than all that, it's been a good week. In 22 days we do the walk for Conquer Chiari!